The bathroom is the very last room you will pack. You cannot pack it sooner because you and everyone in your home will need access to a functioning bathroom every day, even on moving day. However, putting off packing up the bathrooms to the very last minute is not a good idea, either. If you do, you could risk just tossing items into boxes and potentially having to deal with liquids oozing out of containers, as well as broken glass, and other damages. Pack what you can ahead of time. Go through and sort the items in your bathroom and see what you can pack up now. As you are going through items, remember to get rid of anything you no longer want or need. Call your local pharmacy and see if you can drop off old and expired medications there for proper disposal. Pack essentials in toiletry bags. All members of the household should have their own toiletry bags. The bag can be used to pack oral care products, contact lens cases and solution, makeup, nail care kits, and so on. Plus, toiletry bags are much easier to pack into a moving box than just tossing in each individual item. Prevent spills by packing liquids correctly. When you are ready to pack up perfume, cologne, shampoo, conditioner, mouthwash, toothpaste, and other such liquids, make sure you have plenty of plastic wrap and zip-locking plastic bags. Open each container and take a piece of plastic wrap and put it over the opening and put the cap back on. Next, put the items into a zip-locking plastic bag. You can pack more than one item into plastic bags. Your shampoo and conditioner can go in one. For liquids in glass bottles, wrap these to prevent breakage. You can either use bubble wrap or a bath towel or washcloth to provide padded protection. Use a trash bag to pack shower curtains and liners. On moving day, you can easily and quickly pack up shower curtains and liners by placing them in trash bags before putting them in a moving box. This way, if you or anyone else took a shower that morning, you don’t have to wait for the curtains and liners to dry. Pack cleaning supplies apart from other bathroom items. Since cleaning supplies can contain chemicals, you don’t want to pack these in with hairbrushes, toothpaste, etc. To prepare cleaning supplies, take a piece of duct tape and put it over any nozzles and the neck of the bottles. Place one cleaning product container inside one zip-locking bag. 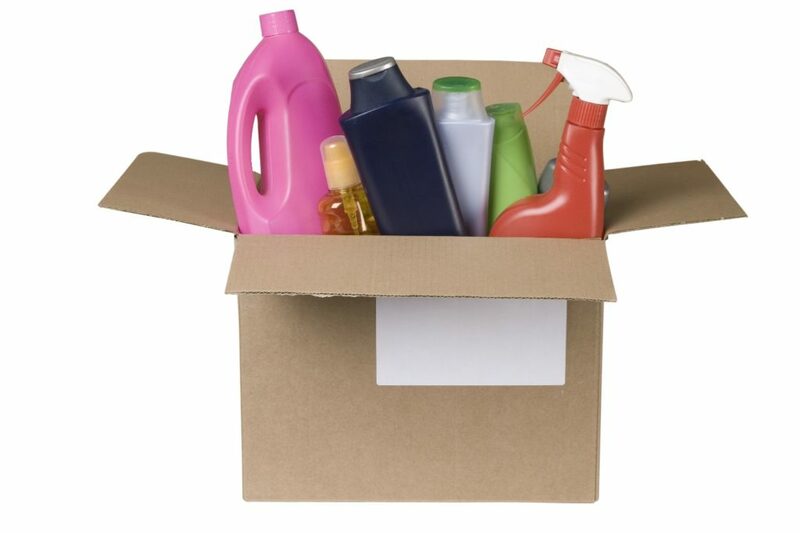 You don’t want to put multiple cleaning products into the same bag, as certain chemicals should not be mixed together. Put the toilet cleaning brush into a large zip-locking bag. On moving day, you will want to keep one functional bathroom with toilet paper, soap, and a hand towel until everything is loaded onto the moving truck and you are ready to leave. For more great moving tips, to request a moving quote, or to learn more about our concierge residential moving services, please feel free to contact the proud mover of the Chicago Cubs, Midway Moving & Storage at (773) 588-7000 today!